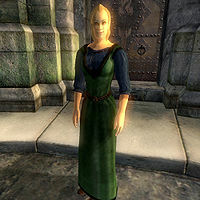 Tandilwe is an Altmer priestess living in the Temple District of the Imperial City. She offers master training in Speechcraft. Tandilwe can always be found inside the Temple of the One, where she wanders around all day and night, without ever sleeping or eating. Therefore, she's available for training 24 hours a day. The exception to this routine is during the Light the Dragonfires quest, when Tandilwe gets disabled until you complete the quest. She wears a blue & green outfit and a pair of quilted shoes. She also carries a small amount of gold. Tandilwe has the ability to use a leveled set of priest spells and one extra major Restoration spell. After the Master Training Quest is initiated, speak with her, and she will give you the following task: "You would seek to better yourself? First, I would ask that you look to the poor and the suffering around Cyrodiil. Travel to all of our cities, and speak with the unfortunate souls forced to beg for change. Look into their hearts, and then look into your own. Return to me when you have spoken with all of them. Then we shall talk of training." If you return to her before you have spoken with all of the beggars, she will say: "There are still poor souls in this world that you have not spoken with. They wait for you." After you have spoken with all the beggars, she will finally offer you training: "You have seen the Beggars. You have, I hope, used your powers of speech to raise their spirits. Now I can help you to improve those powers, to help make lives better." If you kill any beggar before speaking with her, she will respond with: "The death of any helpless individual is tragic, and reprehensible when it could have been prevented. I hold you responsible. You will receive no training from me. Not now, or ever!" Esta página foi modificada pela última vez à(s) 21h23min de 6 de janeiro de 2015.